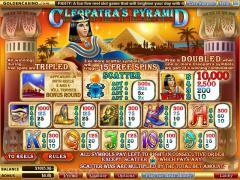 Cleopatra’s Pyramid is a video slot from Vegas Technology. It has 5 reels, 20 paylines and a maximum bet of 20 coins. 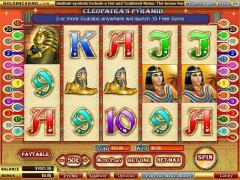 The slot has the popular Ancient Egypt theme and within that the even more popular Cleopatra theme. The fascinating Cleopatra in all her regalia is the wild symbol. The Scarab is the scatter symbol and the Pyramid is the bonus symbol. The Scarab triggers the free spins bonus round and the Pyramid triggers the bonus game on the second screen. The other symbols on the reels are also typical of the ancient Egyptian culture. They include the Ankh, Sphinx, Mummy and Ma’at. The high card values from Nine to Ace make up the remaining symbols. These are also fashioned in an ornate manner befitting the theme. Before starting the game players will have to choose the coin denomination by operating the +/- signs on either side of the coin denomination button. Coin denominations are 0.01, 0.05, 0.10, 0.25, 0.50, 1.00, 5.00 and 10.00. Players will also have to enable up to twenty paylines by clicking on the BET ONE button the appropriate number of times. All twenty paylines can be activated by clicking on the BET MAX button. Winning combinations pay only if they occur in enabled paylines. 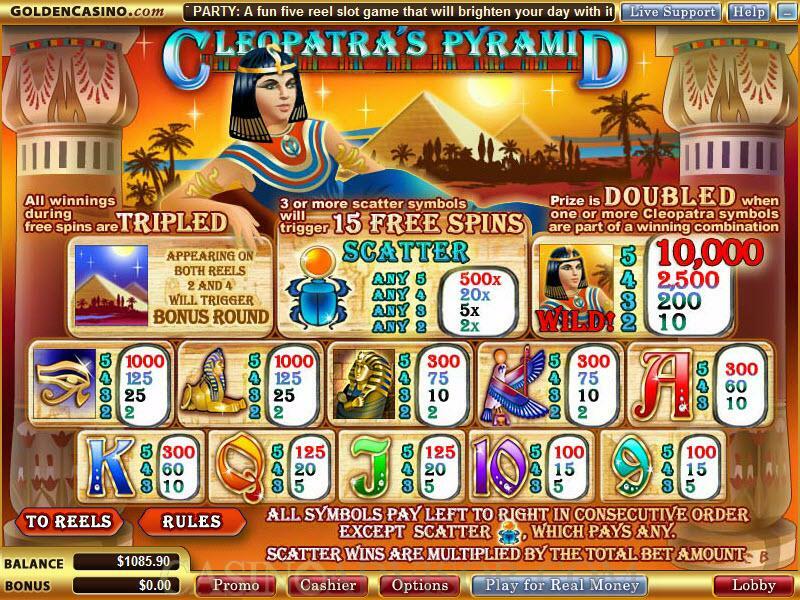 In Cleopatra’s Pyramids players can wager only one coin per payline by default. But this is hardly a problem because the coin denomination range is suitably larger. Once the settings have been completed the game can be started by clicking the SPIN button. Cleopatra is the wild symbol and a very magnanimous one. It doubles payouts when it substitutes to make a winning combination. 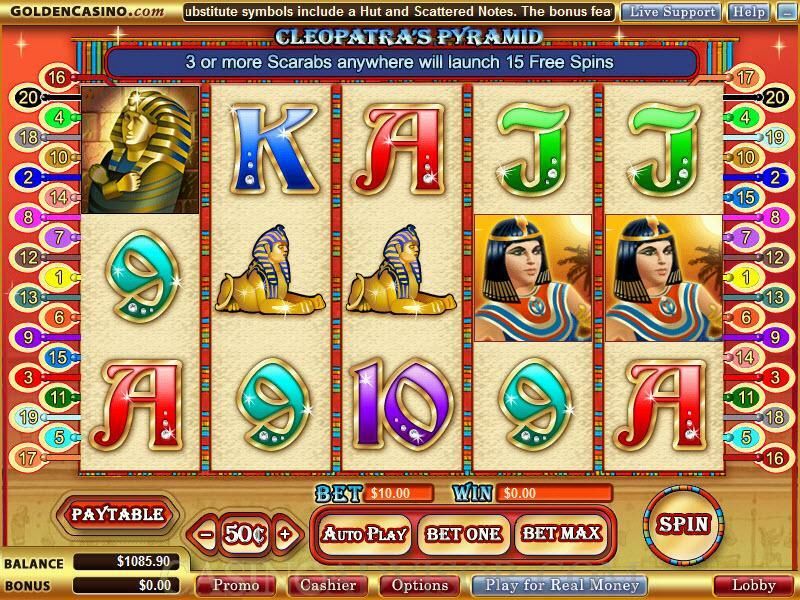 It also offers a fixed jackpot of 10000 coins when five Cleopatra symbols appear in an enabled payline. The Scarab is the scatter symbol. Two or more scatter symbols result in scatter payouts. Five scatter symbols have a payout of 500 coins. The free spins feature is triggered when 3 or more scatter Scarab symbols appear anywhere on the reels. 15 free spins are offered at tripled payouts. Additional free spins can be triggered during the free spins round but these additional free spins are at normal payout. The Pyramid symbol appearing simultaneously on reels 2 and 4 triggers the bonus game on the second screen. There is a pyramid on the second screen that has stones in various levels. The player has to first choose a stone at the bottom level. If it reveals a cash prize the player can move to the higher level till he reaches the top. However if any stone reveals a snake then the game is over and the credits accumulated till then are transferred to the player’s account. Interested in reading more detailed information about Cleopatra's Pyramid? If so Click Here for more details.